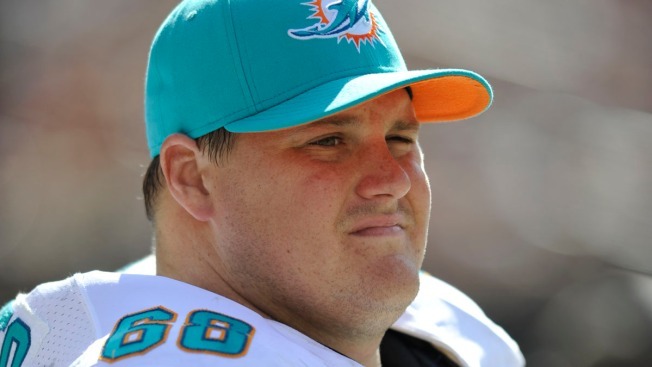 Boca Raton police say a patron at Life Time Athletic, Mark O'Brien, told officers James Brown and Dave Rosenthal he was jogging on the outdoor track when he saw Incognito acting angry. O'Brien said he tried to calm Incognito, but as he walked away, the former Buffalo Bill threw a tennis ball at his foot, tried to run him over with a weighted pushing sled and then threw two weights — one into the pool and another at him, which missed. He said Incognito, 34, then cursed at him, telling him to get out of his "playground." O'Brien called 911 and in a recording released Thursday a voice identified as Incognito's can be heard in the background yelling and cursing at him. He told the dispatcher Incognito, who was dressed in shorts and no shirt, was trying to hit him as they talked. He told the dispatcher the 6-foot-4, 322-pound Incognito is "huge" but a "little overweight." O'Brien told The Associated Press on Thursday that Incognito also ripped apart a boxing mannequin and slammed his knee into its head, and feared Incognito might do the same to him. He said he didn't know Incognito, who also played for the St. Louis Rams and Miami Dolphins, where he was suspended in 2013 for the racial bullying of a teammate, Jonathan Martin. "I can fully appreciate and understand people going through tough times and mental illness but his behavior was irrational. I hope he gets help," O'Brien said. Officer Brown wrote that when he and Rosenthal arrived at the gym, a staff member handed them Incognito's concealed weapons permit and told them he had thrown objects at the staff. No gun was found on Incognito and it is unexplained why the employee would have his permit. "I'm running NSA class level 3 documents through my phone," Incognito told Brown, saying he couldn't have anyone with Bluetooth capability near him. Brown said that when he asked Incognito why the government would be watching him, he replied that Brown didn't have a high enough security clearance to discuss it with him. He said Incognito's hands were shaking and he would suddenly jump and move without warning. Incognito told the officers he was taking a dietary supplement and denied thrown objects at people. Brown and Rosenthal took Incognito into custody under Florida's Baker Act, which allows for people to be hospitalized for 72 hours if they are deemed a danger to themselves or others. Incognito's lawyer, Mark Schamel, did not immediately return an email Thursday seeking comment. Incognito has not been charged with a crime as police say in his mental condition he could not form intent. The Bills also asked Incognito to take a pay cut in restructuring the final year of his contract. Incognito initially backed the agreement by posting a note on Twitter saying he was "thrilled to be returning this season and fired up to get back to work with my Buffalo Bills brothers." However, he had a change of heart weeks later and abruptly fired agent David Dunn in a post on Twitter.